Dads who visit Mexico during the month of June will be treated to a lavish complimentary spa treatment in honor of Father’s Day when they book a 3-night stay in a Casita at the Marquis Los Cabos beachfront resort. Dads who visit Marquis Los Cabos during the month of June will be treated to a lavish complimentary spa treatment in honor of Father’s Day when they book a 3-night stay in a Casita at the 237-suite beachfront resort. The three-hour Father’s Day spa ritual consists of an ion detox, body exfoliation, algae and mud wrap, deep facial cleansing, and relaxing massage, all of which are specially designed for a man’s skin and muscles. The main ingredients used in the ritual are essential oils known to achieve high levels of masculine energy, such as patchouli, cedar, and cardamom. The complimentary Father’s Day amenities during the month of June 2010 are available only for guests who book a minimum of three nights in the Casita suite category. Casita rates begin at $825 per night. The Father’s Day Treatment is a $470 travel value for guests that stay in other suite categories. Tax and service charge are additional. For reservations, please call 1-(877) 238-9399 or visit the website at http://www.marquisloscabos.com. Featured in National Geographic Traveler’s “Hotels with a Heart,” the Marquis Los Cabos donates five percent of the hotel’s annual revenue for the staff’s education and healthcare in its Marquis University. Since 2003, the resort has helped on average 20 employees a year obtain primary schooling and bachelor degrees. The 237 all-suite beachfront Marquis Los Cabos Resort is located on the southernmost tip of the Baja California península, where the Sea of Cortez meets the Pacific Ocean, and is minutes from the authentic Old World village of San Jose del Cabo as well as the lively town of Cabo San Lucas. The resort features a 15,000 square foot holistic spa and fitness center, an exclusive gourmet restaurant where a Michelin-pedigreed chef prepares a nightly prix fixe menu and an extensive collection of Latin American sculpture and painting on display in public areas and guest suites. 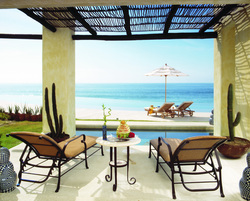 Since its 2003 opening, Marquis Los Cabos has earned the travel industry’s most coveted awards including “World’s Best” (Travel + Leisure); “Gold List” (Conde Nast Traveler); “Best Value” (Conde Nast Traveler); the AAA Four Diamond, and the Five Star Diamond for its Canto del Mar restaurant. Marquis Los Cabos is a member of the prestigious Leading Hotels of the World and the only member of Leading Spas of the World in Los Cabos.